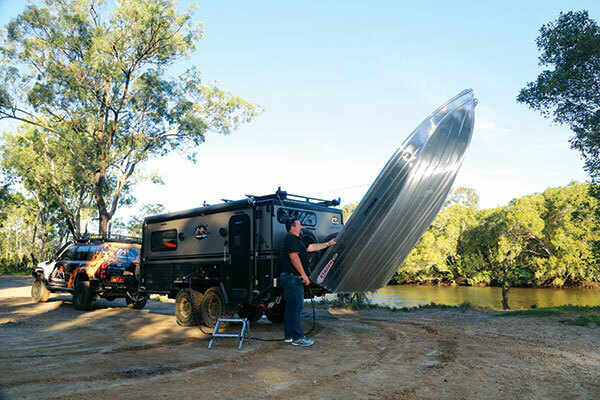 Extreme Outback Campers might seem to be an odd name to appear in the pages of Caravan World but that’s because the manufacturer has produced what very much looks like a pop-top offroad caravan. Okay, so the Curlew, a great migratory sounding name and very apt, does have a few camper trailer features but it’s mostly caravan. The brainchild of keen campers and partners Mark Timms and Sheree Davies, the Curlew has been a two-year development project which, apart from anything else, shows a great deal of persistence and patience. The first thing noticeable about the Curlew is that it has a very business-like (the offroad business that is) air about it. Everything from the raised ground clearance to the good departure angle of the rear body and the obligatory black checkerplate tells you something. 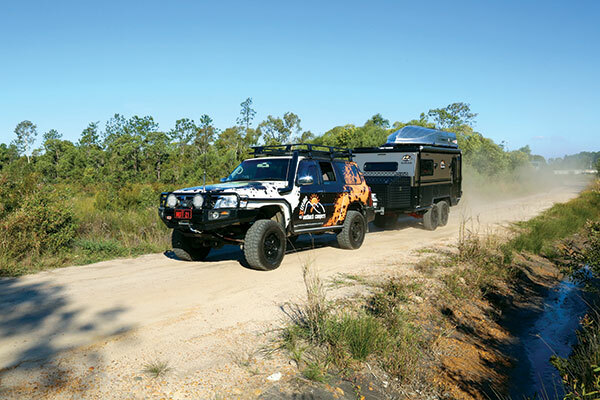 What it does not have is an excessive travelling height and for many that’s going to be a useful feature – both when negotiating tree-lined tracks or hurtling down the Bruce Highway. It’s not an unattractive looking van either, certainly the champagne-coloured composite walls stand out in the crowd. As does the rooftop boat, which you can see in the photos. 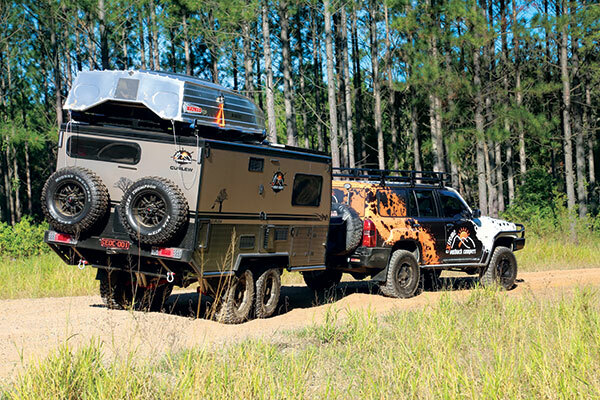 At 4.5m (14ft 9in) long and with an overall length of 6.92m (22ft 8in), the Curlew is well sized for offroad travel. With a Tare mass of 2100kg, it’s not particularly lightweight and the ATM of 3400kg does give it an impressive 1300kg of load capacity. Which does bring on the question of what sort of tow vehicle would be appropriate. Travelling lightly sans boat, you might get away with a Toyota Prado (2500kg). Around the 3000kg means one of the 3500kg-rated utes might be a good proposition but anything close to fully loaded would definitely require something like the Extreme Outback Nissan Patrol. Apart from anything else, it’s a stable tow vehicle and plenty of grunt. It would be surprising if the Curlew wasn’t built on a box section galvanised chassis and it is, with 150x50mm (6in x 2in) rails and drawbar. 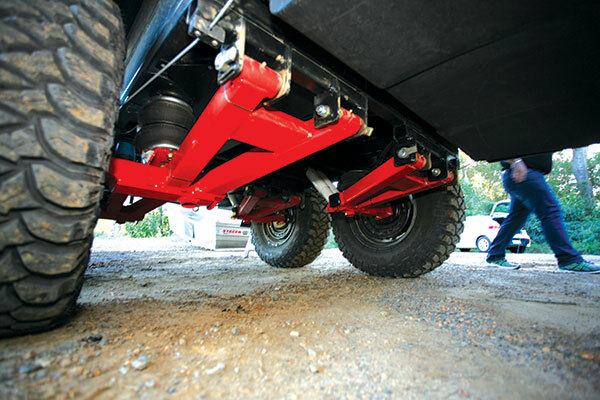 Given the ground clearance, there is something of a disparity between the drawbar height and the tow vehicle hitch height. However, that is neatly accommodated by the angled hitch end of the drawbar rails. The chassis is powdercoated in black, so it doesn’t have the normal galvanised look. 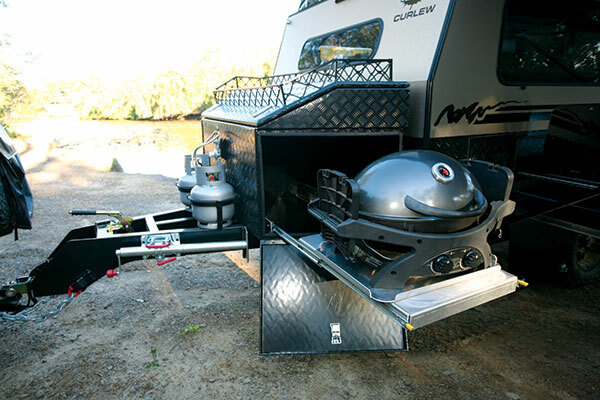 In keeping with the overall theme of this caravan, the suspension is top drawer, a Cruisemaster independent setup with adjustable airbags and dual shock absorbers per wheel. In addition to the suspension, Vehicle Components also supplied the DO35 tow coupling for the Curlew. All that load capacity does need to be utilised somehow, and the Curlew is certainly well-equipped in that department. Appearances are slightly deceptive because there appears to be a large tunnel storage and a large storage box on the front drawbar. However, much of the tunnel storage is taken by the slide-out kitchen and there are slide-outs in the front box for both a generator and a covered barbecue. A closer look reveals several drawers fitted into the compartments on both sides and a firewood storage above the front drawbar box. No space is wasted and it’s all practically done. All the bin doors have pinch weld sealing. Building a caravan for remote location travel does require a comprehensively set up electrical system, which the Curlew certainly does. The two 120Ah deep-cycle batteries supply a good load capacity and can be charged by the two 180W solar panels or the 40A mains charger. In addition to all the normal 12V electrical items there are also an inverter, rams for lifting the pop-top roof, and the winch for lifting the boat on and off. I must admit that I normally prefer the electrical panel inside the caravan but in this case given the internal space, the neatly laid out panel with 12V switches, airbag controls, and water tank gauges works well. Additionally, the panel door doubles as a picnic table. Being only 4.5m (14ft 9in) long, the Curlew has a slightly compressed layout inside. 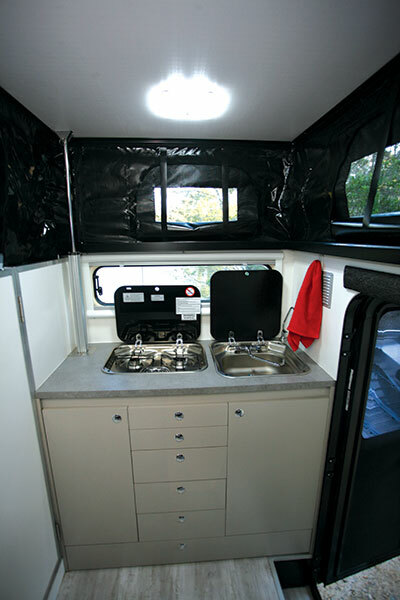 Of course you get all the essentials – island bed up front, sideways-facing seat by the door, shower cubicle in the offside rear corner and a kitchen that fits around all that. No comfort is spared, right down to the Heron 2.2 air-conditioner and the diesel-fired Eberspacher heater. The internal colour scheme was light but I found the black colour of the pop-top vinyl a bit oppressive in the confined space – I’m thinking lighter colours are certainly available. Across the rear is the kitchen bench. In addition to a generous cupboard and storage area, it comes with the same facilities as the external kitchen – two-burner cooker and stainless steel sink. An additional feature, is the all-essential Dometic two-way 121L fridge. 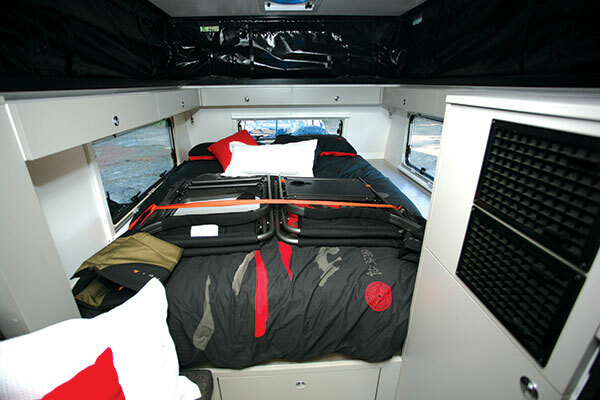 Like the rest of the van, the bedroom area looks a bit compact but it comes with a queen-size innerspring mattress and a scaled down version of overhead lockers. In addition to that, the offside under-window space gets a couple of storage compartments and there are two under-bed drawers as well. The Curlew is a very well-appointed offroad caravan. It may not have the space of a full-sized caravan but it has just as many features. 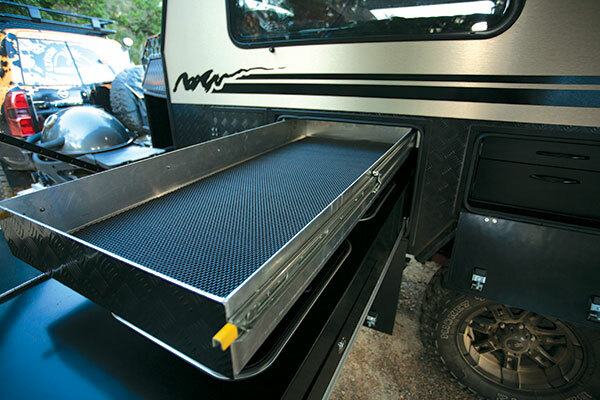 The asset of its size is the ability to handle all kinds of rough roads without wondering if the van is going to fit through with the tow vehicle. 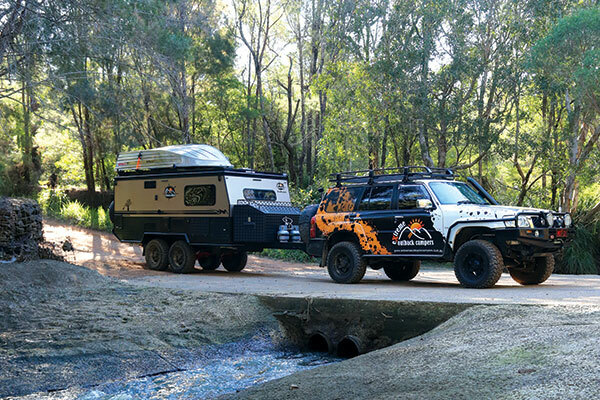 What is most obvious about the Curlew is that it has clearly been designed and put together by someone who not only loves the camping lifestyle but also offroad travel as well. That’s the sort of experience that makes all the difference in a caravan design.